Welcome to Tea for Tuesday! I thought I would share another teacup story with you. 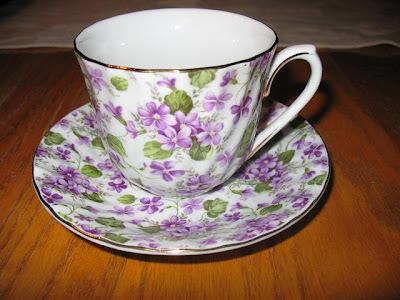 I think of this teacup as Pretty Posies because of all the pretty purple flowers on it. This is the only teacup that I have ever purchased brand new for myself. A few years ago, I helped teach a Christian moms co-op preschool. Those little kids were so adorable! That year was very challenging - teaching is a tough job! The end of that school year was a bit of a relief for me as I do not feel called or led to teach. After it was over, all the moms were sweet enough to treat us teachers to a full lunch tea at a cute tea place. It was a lovely time of fellowship, fun, and laughter. As we were getting ready to leave, I spotted this teacup. It was so pretty, but I was considering whether or not to purchase it. I ended up deciding to get it as a gift to myself - both as a memory of that time and as a reward for completing a challenge that was out of my comfort zone. I'm glad I bought it! I will always remember that time by seeing my cup (and from still seeing some of those sweet kids who are now third-graders!). I hope you enjoyed today's little teacup tale. Have you ever purchased a brand new teacup for yourself? I know that this is going to come as a surprise, but I don't feel led to teach either. So not my gift! LOL. I love that tea cup! It's so dainty. BIG Posie size hugs to you! Love the tea cup. Very pretty! And it's my favorite color, too! I might have to break out a few of mine & take pics of them to share. That would be fun! I used to think all tea/coffee cups should match. However I have changed my mind. After receiving some as gifts as well as purchasing a funny one or a special one. I realize I to think of the situation or person whom the cup came from! It's like a little butterfly kiss that comes unexpected to me during my day- when I reach up onto my shelf & get a special cup down. I love the idea of purchasing a teacup as a memento. I have two that I particularly like. One was purchased during a "girl's trip", and I get to experience such warm memories each time I use it. I painted the other myself along with my best friend at one of these paint-your-own-pottery places. We had so much fun that day, and I got to take home a teacup of my own design! What a beautiful cup! I'm glad you bought it, too! It reminds me of several my grandmother gave me when she was diagnosed with terminal cancer. They are very special to me and nearly brought tears to my eyes. It is beautiful! I've never bought one new for myself. A couple years ago I scoured thrift stores and yard sales for enough cups for the Mother/Daughter tea at our church. So many pretty ones. Someday I'll unpack them and keep some out.